Meanwhile, back at the junior royal line of descent from Seth... we might recall that Eve was the progenitor of the Royal Seed... first through Cain (in its full Anunnaki style flower - courtesy of Enki... thrice... and of course, Lilith), and then through Seth (but with just a bit less potency, i.e., containing just a bit less of the Anunnaki blood). The Royal Seed was to be distinguished from the mundane human seed, the latter derived from the Eljo, the sons and daughters of the Naphidem, and quite possibly Homo erectus. There were a LOT of humans running about, but only Eve, and to a lesser extent, Adam, had the Royal Seed to pass to their descendants. According to Laurence Gardner, Genesis of the Grail Kings (pages 48-49), the pre-eminent sons of the Naphidem were at variance with the evolutionary sons of men.” The latter were called the Eljo, and were the recipients of a genocidal war waged by the Naphidem, who slaughtered the Eljo wholesale [a tradition carried down through millennia... with only the names and players being changed... but with the same old excuses and rationalizations]. It should be noted that the Naphidem were the lesser Anunnaki -- with their children by human mothers even less so. It should be noted, en passant, that Seth’s Biblical line may be, according even to Jewish scholars, something of a fiction. Borrowed names from Cain’s line, borrowed events (such as the Flood), and so forth, tends to diminish the impact of the junior royal line wandering down the millennia with only occasional references to the distinguishing characteristics of Who's Who in Ancient Mesopotamia. Then, thankfully, a 400 year hiatus is encountered and everyone gets a fresh breath of air to claim... with somewhat greater legitimacy... who is entitled to what. Be that as it may... here’s Enosh! that Enos, as the first king by right of descent from Seth, needed help in securing his throne. According to the Book of Jubilees (4:11-13) in the Ethiopian Orthodox Bible, Enos was born in the Year of the World 235. He married his sister, No'am, and she bare him Kenan in the year 325 [when that sly old Enosh was 90 years old!]. Ethiopian Orthodox tradition considers him a "faithful and righteous servant of God", and further credits him with the introduction, following a divine revelation, of the Ge'ez alphabet in its original, consonant-only form, "as an instrument for codifying the laws". [Only God can make a law?] He is further commemorated as one of the Holy Forefathers in the Calendar of Saints of the Armenian Apostolic Church on July 30. From Wikipedia: Kenan (Cainan) was a Biblical patriarch first mentioned in the Hebrew Bible book of Genesis as living before the Great Flood. [Inasmuch as the Flood happened long before Kenan, we might have to take this idea with a heavy bag of salt.] Born when Enos was ninety years old, Cainan had his only named son, Mahalalel, when he was seventy. Other sons and daughters were born to Kenan before he died at 910 years of age. From Wikipedia: Mahlalail lived 895 years (Genesis 5:12-17), placing him eighth in the records for the unusually long life spans of the so-called Patriarchs in Genesis. Later references to Mahalalel include Jubilees 4:14–15 and Luke 3:37. Enoch’s first Dream Vision in 1 Enoch 83 recounts the dream that Enoch had in the house of Mahalalel his grandfather, and which Mahalalel explains to him. Jared in Judeo-Christian religious belief was a fifth generation descendant of the woman called Eve and her husband, Adam. His father Mahalalel was 65 years of age when Jared was born. While the Bible speaks of Jared having become father to several sons and daughters, Enoch is the only son specifically noted by name (born to his father in Jared’s 162nd year). Other sources, however, report that Jared did have a daughter named Ezrael. The grandchild of Jared’s is Enoch’s son Methuselah, the longest living human mentioned in the Bible. Additionally, Jared was a forefather of Noah and his children, and (allegedly) an ancestor of Jesus Christ (according to Wikipedia). Jared was 962 years old when he died, the second longest living person mentioned in the Bible. His story is accounted in Genesis 5:18-20. From Wikipedia: Enoch is on the one hand described as a great-grandson of Adam via Cain, and as having had a city named after him. The second mention of the name describes Enoch as Adam's great (x4) grandson, through Seth and adds that Enoch "walked with God, and was not, for God took him," thus avoiding death at the age of 365. The following might be descriptive of either (or one in the same) Enoch. Enoch is one of the main two focal points for much of the 1st millennium BC Jewish mysticism, notably included in the Book of Enoch. In Islam, he is usually referred to as Idris, and regarded as a prophet. Additionally, Enoch is important in some Christian denominations: he features in the Latter Day Saint Movement, and is commemorated as one of the Holy Forefathers in the Calendar of Saints of the Armenian Apostolic Church and Armenian Catholic Church on July 30. Among the minor Midrashim, esoteric attributes of Enoch are expanded upon. In the Sefer Hekalot, Rabbi Ishmael is described as having visited the 7th Heaven, where he meets Enoch, who claims that earth had, in his time, been corrupted by the demons Shammazai, and Azael, and so Enoch was taken to Heaven to prove that God was not cruel. Similar traditions are recorded in Ecclesiasticus. Later elaborations of this interpretation treated Enoch as having been a pious ascetic, who, called to remix with others, preached repentance, and gathered (despite the fewness of people on the earth) a vast collection of disciples, to the extent that he was proclaimed king. Under his wisdom, peace is said to have reigned on earth, to the extent that he is summoned to Heaven to rule over the sons of God. [Hmmmm...] In a parallel with Elijah, in sight of a vast crowd begging him to stay, he ascends to Heaven on a horse. The author of the Epistle to the Hebrews says "By faith Enoch was transferred, that he should not see death, and was not found, because God had transferred him; for before his transference he had the witness that he had pleased God well." Justin, Athenagoras, Irenaeus, Clemens Alexandrinus, Lactantius, and others borrowed an opinion out of the book of Enoch, that the angels had connection with the daughters of men, of whom they had offspring ('the giants of the past’). Tertullian, in several places, speaks of this book with esteem; and would persuade us, that it was preserved by Noah during the deluge. Most churches, however, including the Catholic, Greek Orthodox, and Protestant churches, do not generally accept it. Origen, Jerome and Augustin, mention it as having no authority. The Qur'an presents Enoch in a similar manner, referring to him as Idris (which is Arabic for Enoch), meaning the instructor, regarding him as a man of truth and a prophet, as well as a model of patience; popular Muslim traditions credit Idris as inventor of astronomy, writing, and arithmetic. Enoch is often described as having been compelled to defend his life with the sword, against the depraved children of earth. Among his lesser inventions, in popular Muslim tradition, were said to be scales, to enable just weights, and tailoring. Among the Latter Day Saint movement and particularly in The Church of Jesus Christ of Latter-day Saints, Enoch is viewed as having founded an exceptionally righteous city, named Zion, in the midst of an otherwise wicked world. This view states that not only Enoch, but the entire peoples of the city of Zion, were taken to Heaven without death, because of their piety. [Possibly a model for the current End of Days fad.] (Zion is defined as "the pure in heart" and this city of Zion will return to the earth at the Second Coming of Jesus Christ [or as a national park located in southwest Utah].) The Doctrine and Covenants further states that Enoch prophesied that one of his descendants, Noah, and his family, would survive a Great Flood and thus carry on the human race and preserve the Gospel. The book of Moses in the Pearl of Great Price has several chapters that give an account of Enoch's preaching, visions and conversations with God. This includes details concerning the wars, violence and natural disasters in Enoch's day, and notable miracles performed by Enoch. Supposedly Adam ordained Enoch to the higher priesthood (now called the Melchizedek, after the great high priest) at age 25, that he was 65 when Adam blessed him, and he lived 365 years after that until he was translated, so making him 430 years old when that occurred. * 1st Book of Enoch, or simply the Book of Enoch, an apocryphal book in the Ethiopic Bible that is usually dated between the third century BC and first century AD. * 2nd Book of Enoch, an apocryphal book in the Old Slavonic Bible usually dated first century AD. * 3rd Book of Enoch, a Kabbalistic Rabbinic text in Hebrew usually dated fifth century AD. Much esoteric literature like the 3rd Book of Enoch also identifies Enoch as the Metatron, the angel which communicates God's word. In consequence, Enoch was seen, by this literature and the ancient kabbala of Jewish mysticism, as having been the one which communicated God's revelation to Moses, in particular, the dictator of the Book of Jubilees. Due to the association of Enoch in Jewish legend (Henosch) with learning and writing, the Ancient Greeks identified him as Hermes Trismegistus, a syncretic deity. Consequently, they also regarded him as the discoverer of the zodiac and of astronomy in general. Enoch also appeared in tales describing heroes being permanently taken by the Gods, such as Ganymede. In historical criticism, these stories are seen as being the influence behind more elaborate traditions such as Enoch traveling to Heaven via a flying horse (compare to the myth of Pegasus). Scholars link Enoch with the ancient Sumerian king Emmeduranki. The specific life span of Enoch, 365 years, corresponding to the duration of the solar year, is linked to Emmeduranki's association with the sun god Utu. In fact most of the Kings of Mesopotamia have a pre-flood counterpart in the Seth line of descendants. From Wikipedia: Methuselah was 187 when he fathered Lamech. A close reading of the dates in the Old Testament reveals that Methuselah is said to have died in the year of the Great Flood, but the Bible does not say that he was among those who died in the flood. Some have interpreted his name as a prophecy: when he dies, the Flood will come. In that case, the long life has an allegorical dimension, showing that God withheld judgment on humans for a very long time. This is because, according to the Bible, he reached the age of 969 years. Genesis 5:27 states, "And all the days of Methuselah were nine hundred sixty and nine years: and he died". Genesis 5:5 states, "So all the days that Adam lived were nine hundred and thirty years, and he died." Assuming Adam's life began at the time of his creation, Adam was alive when Methuselah was born. This makes Methuselah the only human link between Adam and Noah. Modern science puts the natural limit on current human longevity at below 130 years; with the oldest person documented beyond reasonable doubt, Jeanne Calment, who died at 122. This being the case, Methuselah's life span has been a source of much speculation. Some resolve the issue by suggesting that Methuselah's [and the Patriarch’s] long life span is not meant to be taken literally, while others attribute it to translation errors inflating a shorter life span. Witness Lee's "Four Falls of Man" hypothesis claims that man's life span was shortened four times, due to sin: from everlasting to 1,000 (first fall: Adam's), from 1,000 to 500 (second fall: the Earth around the time of Noah), from 500 to 250 (third fall) and finally from 250 to 120 (fourth fall bringing in the law with Moses). Notably, in the times of King David, when actual [i.e., less controversial] ages were recorded, the ages of the kings generally were in the range of 40-70 years old. Such sin-based life-shortenings might actually make a certain degree of sense in that the step-wise fashion in the ever shortening ages of the patriarchs can also be explained by nourishment... of the soul enhancing kind. It’s the old “you’ve-been-bad-so-we’re-shortening-your-life-by-not-feeding-you-properly” parental model. See, for example: The Adam's Family. A separate theory argues that the most natural time span to be noted by early humans involved the lunar cycle as indicated above, followed later by changes of seasons. During early recognition of the world around them, humans would be expected to note the lunar cycle and perhaps record it in early spoken and written histories as "years", while noting weather only on a day-to-day basis such as "today it is rainy", or cold, or sunny, etc. Once humans began to recognize that weather patterns were more consistent over a longer period of time, cold for the duration of Winter, warm for Spring, hot for Summer, etc., it is possible that these longer time periods may have been recorded in verbal and written histories as "years" (or what modern humans might indicate as "He lived for 160 seasons, equating to 40 modern years but perhaps noted by early humans as 160 "years" rather than 160 "seasons"). As such, as lunar cycles would be recognized first, then seasonal cycles, and only third the modern 365-day calendar, it would make sense that the earliest humans' ages indicated in the Bible corresponded first to lunar cycles (13 per modern calendar year so Methuselah may have actually been 969 / 12.37 = 78.33 modern calendar years old at death), followed by later early human ages in the Bible corresponding to seasonal cycles (4 per modern calendar year so when Enosh had a child at 90 "years of age" he may have been 90 / 4 = 22.5 modern calendar years of age). Only in the modern age should modern calendar (365 day long) years be expected to be accurate, as recognized by many historians as one of the most significant achievements of the Ancient Egyptians, but the earliest Biblical characters were not in Egypt per the Book of Genesis (until Joseph was taken to Egypt as a slave and his family followed much later) and therefore would not necessarily be expected to recognize the 365-day Egyptian calendar year. Another [attempted] solution involving translation error suggests that inaccurate conversion between various ancient Sumerian numerical systems produced the ages of Methuselah, Noah, and kin out of archaic Sumerian numerals. Thus, Methuselah's actual age would have been 85, and that he would have had his first son at age 17 (instead of age 187). Laurence Gardner, Genesis of the Grail Kings, Bloodline of the Holy Grail, The Magdalene Legacy, etceteras, takes a totally different tact: Gardner (and this author) assume that the ages described in the Bible were real, and that a step-wise reduction in the kings and their descendants’ access to the proper food and nourishment was responsible. This nourishment is better known as The Philosopher’s Stone and the Elixir of Life, the Ormus, the Orme, the white powder (or monatomic state) of gold or other precious metals (silver, platinum, rhodium, iridium, palladium, osmium, and, ruthenium), and/or as identified by Gardner, Star Fire. Alternatively, the whole Seth line description may be mythical, a fantasy for children, and not to be countenanced. The only problem with this is that the ancient kings of Sumer -- who were probably real -- did have extraordinarily long lives. Thus, even with the Public Relations of the Seth Lineage, LLC, managing to copy and plagiarize the legends of the Sumerians, there was still the very real possibility that the right diet can really extend one’s lifetime beyond currently perceived limits! 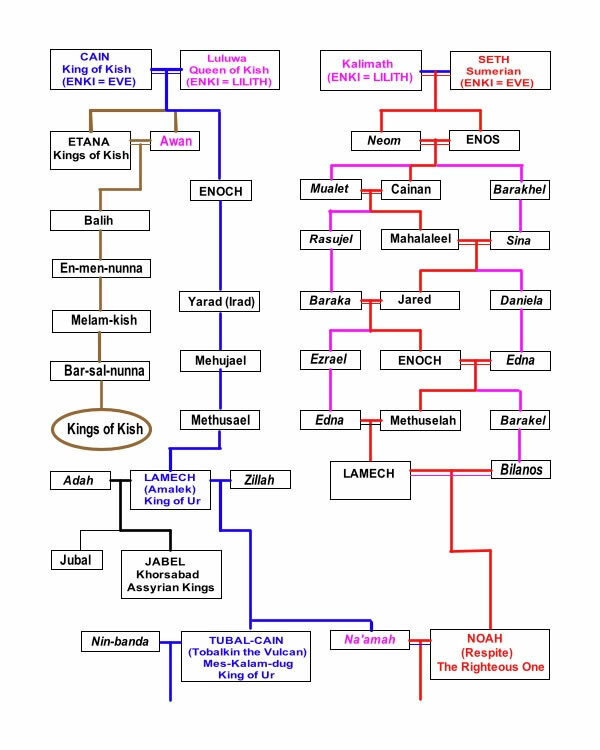 The other Lamech is an eighth generation descendant of Seth (Genesis 5:25) (14th of Tiamat). Because of the similarities between the two lines, some critical scholarship regards both Lamechs as one and the same. Many more conservative scholars see no reason to confuse the two and don’t. One tradition indicates further that Na'amah, the daughter of Tselah and Lamech, son of Methushael, was the wife of Noah, the son of the other Lamech (son of Methuselah). Genesis 5:25-31 records that the other Lamech, the son of Methuselah, was 182 years old at the birth of Noah, and that he lived for another 595 years after this, making his age at death 777 years (or just a few years before the Flood). With such numbers in this genealogical account, calculations such as those of Archbishop Ussher would suggest that Adam was still alive for about the first 50 years of Lamech's life. On the other hand -- there are always spoil sports -- the names surrounding Lamech can also be interpreted, as in the Midrash, as an attack on polygamy [e.g., by a Republican Congressman]. It further goes on to claim that part of the immorality of the humans, which allegedly led God to flood the earth, was the polygamy practiced by Lamech and his generation. Specifically, Adah is there interpreted as the deposed one, implying that Lamech spurned her in favor of Zillah, whose own name is understood to mean that she shaded herself [making her a “Shady Lady” in the best traditions of the Craft]. The Midrash consequently regards Adah as having been treated as a slave, tyrannized by her husband, and who was at the beck and call of his mistress, Zillah. While the Deluge and Noah's Ark are the best-known elements of the account of Noah, he is also mentioned in Genesis as the "first husbandman" and the possible inventor of wine, as well as in an episode of his drunkenness and the subsequent Curse of Ham. [In the orthodox version, Ham is Noah’s son, and herein (in the definitely unorthodox version), Ham is the son of Tubal-Cain, in the descent of Cain... and thus becomes Noah’s nephew. It would probably be easier to curse a nephew than a son... but most Biblical characters appear to have little hesitation to do in sons as easily as strangers.] The story of Noah is the subject of much elaboration in the later Abrahamic traditions, and was immensely influential in Western culture. Jewish thinkers have debated the extent of Noah's righteousness. Christians have likened the Christian Church to Noah's ark. [*Mount Ararat's elevation is given in feet above today's sea level. In Noah's time, it was at one point, about 12 and a half inches above sea level... for a very brief period. Then God made a covenant: Noah and his descendants would henceforth be free to eat meat ("every moving thing that lives shall be food for you, and as I gave you the green plants, I give you everything"), and the animals would fear man; and in return, man was forbidden to eat "flesh with its life, that is, its blood." And God forbade murder, and gave a commandment: "Be fruitful and multiply, bring forth abundantly on the earth and multiply in it." And as a sign of His covenant, He set the rainbow in the sky, "the sign of the covenant which I have established between me and all flesh that is upon the earth." Noah then gave his blessing to Shem and Japheth: "Blessed be the LORD, the God of Shem! May Canaan be the slave of Shem. May God extend the territory of Japheth, may Japheth live in the tents of Shem, and may Canaan be his slave." Gnosticism was an important development of (and departure from) early Christianity, blending Jewish scriptures and Christian teachings with traditional pagan religion and esoteric Greek philosophical concepts. An important Gnostic text, the Apocryphon of John, reports that the chief archon caused the flood because he desired to destroy the world he had made, but the First Thought informed Noah of the chief archon's plans, and Noah informed the remainder of humanity. Unlike the account of Genesis, not only are Noah's family saved, but many others also heed Noah's call. There is no ark in this account; instead Noah and the others hide in a "luminous cloud". The Islamic narrative of Noah does not include the Genesis account of Noah's drunkenness, and the possibility of the Curse of Ham narrative is in fact implicitly excluded. [Which would make sense (i.e., be politically correct) in that Ham was alleged by the orthodox to be the progenitor of the Muslims!] Meanwhile, the Quranic Noah saves two sons, his third son not joining his father despite Noah's final plea to be saved ("O my son! Come ride with us, and be not with the disbelievers!" [infidels? ]); instead he flees to the mountains, and God tells Noah that this is because he is an evildoer. (In later Islamic tradition the son is given the name Canaan). Shi'ah Muslims believe that Noah is buried next to Ali within Imam Ali Mosque, in Najaf, Iraq. According to the so-called documentary hypothesis, the first five books of the Bible, including Genesis, were collated during the 5th century BCE from four main sources, which themselves date from no earlier than the 10th century BCE. Two of these, the Jahwist, composed in the 10th century BCE, and the Priestly source, from the late 7th century BCE, make up the chapters of Genesis which concern Noah. The attempt by the 5th century editor to accommodate two independent and sometimes conflicting sources may account for the confusion over such matters as how many pairs of animals Noah took, and how long the flood lasted. According to Wikipedia, Noah's great grandfather Enoch is the beginning of a web of similarities between the story of Noah and older Mesopotamian myths. According to Genesis 5:24, at the end of his 365 years Enoch "walked with God, and was not, for God took him" - the only one of the ten pre-Flood Patriarchs not reported to have died. It is not explicitly stated where he is taken. In a late Apocryphal tradition, Methuselah is reported to have visited Enoch at the end of the Earth, where he dwelt with the angels, immortal. The details bring to mind Utnapishtim, a figure from the Mesopotamian Epic of Gilgamesh - where the hero Gilgamesh, after long and arduous travel, finds Utnapishtim living in the paradise of Dilmun at the end of the Earth, where he has been granted eternal life by the gods. (Gilgamesh's reason for seeking out Utnapishtim, incidentally, was to learn the secret of immortality - like Methuselah, he comes close to the gift but fails to achieve it). Utnapishtim then tells how he survived a great flood, and how he was afterwards granted immortality by the gods. It should be noted that any archaeological evidence of an ancient flood does not in any way validate Noah and his biblical history. The hero of the flood might be otherwise named... as for example, the Sumerians also described a Deluge/Flood where the hero was ZI-U-SUDRA.